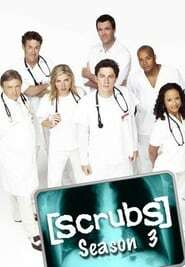 The third season of the American comedy-drama television series Scrubs premiered on NBC on October 2, 2003 and concluded on May 4, 2004 and consists of 22 episodes. This season features many fantasies as well as features many well known actors in guest roles such as Scott Foley, Michael J. Fox, Bellamy Young, Brendan Fraser and Tara Reid.